Edinburgh Festival performers join BP protest – BP or not BP? Posted on August 16, 2015 by BP or not BP? 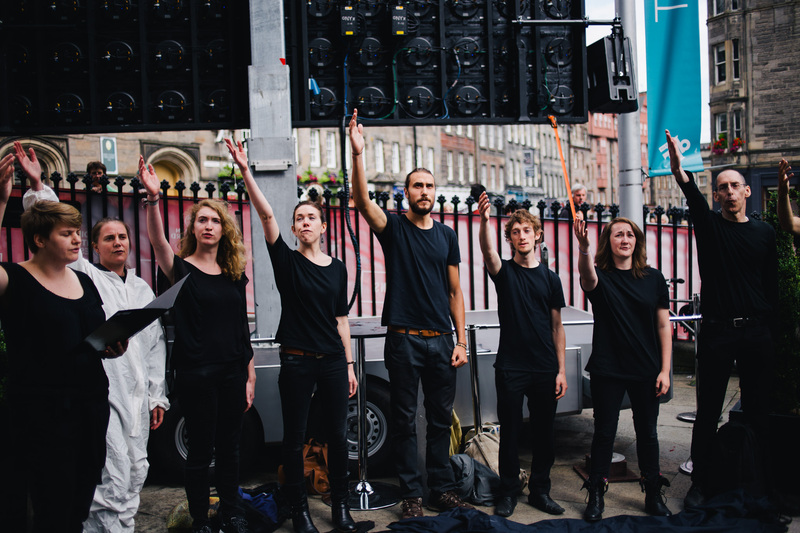 Today, Edinburgh International Festival (EIF) faced two performance protests targeting its controversial Festival Partner, BP. Acclaimed actor, Simon McBurney, who is getting five-star reviews for his EIF show ‘The Encounter’, joined the performers, along with Fringe First winner Daniel Bye and MSP Alison Johnstone. 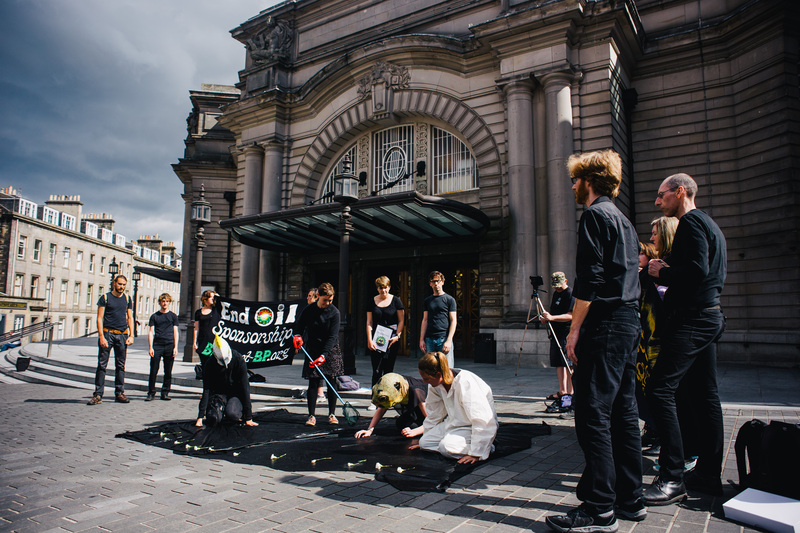 At the doors of the iconic Usher Hall building, one of the main EIF venues, the group of 30 recreated BP’s Gulf of Mexico spill with a theatre piece called ‘Gross Negligence’. 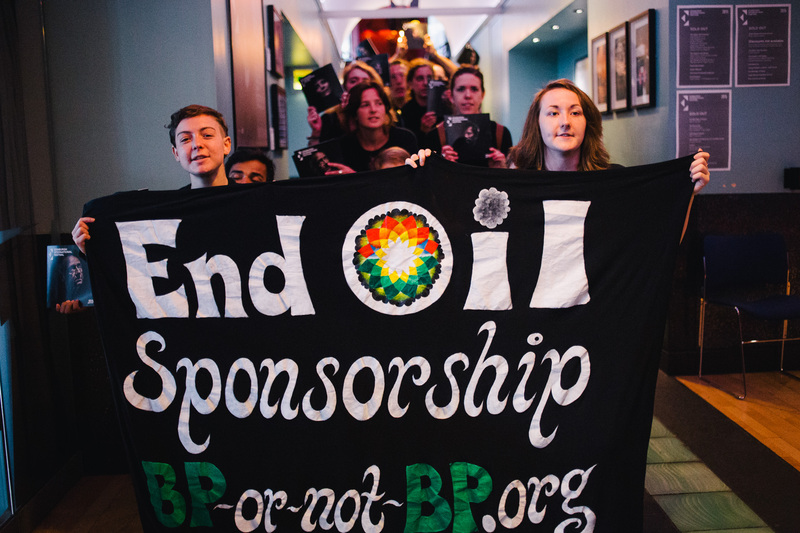 The group then moved into EIF HQ – “The Hub” – where they filled the corridor with song before ripping the BP logo out of their programmes and leaving them, free from oil sponsorship, in the building’s foyer. They then recreated the spill once more, just outside the front door. Many Festival-goers took flyers and some expressed their support. The performance was organized by activist theatre group BP or not BP?, Friends of the Earth Scotland and Edinburgh University People & Planet. They were also joined by representatives of the PCS Union, who support the campaign against oil sponsorship of the arts and recently joined the Art Not Oil coalition. BP has sponsored the EIF for 34 years. The oil giant’s sponsorship of other high-profile arts organisations, including the British Museum and Tate, has been a target for a growing number of creative and disruptive protests in recent months. 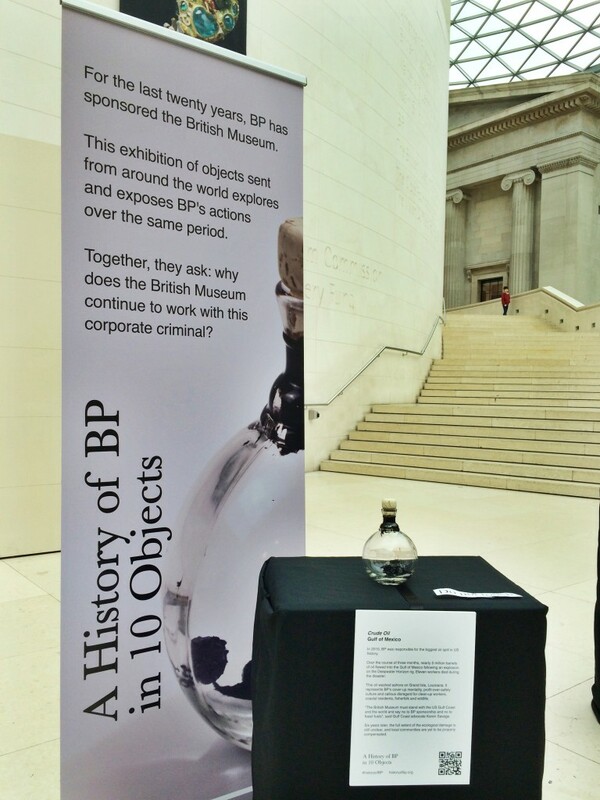 Campaigners and artists are concerned that cultural institutions are giving BP legitimacy while the company continues to extract unsustainable levels of fossil fuels, including the most highly-destructive such as tar sands, fracking, deepwater and Arctic drilling. Meanwhile, BP uses its influence to lobby against effective climate action. BP recently officially became the world’s biggest corporate criminal, following a record-breaking $4.5 billion legal payout in 2012 and a further $18.7 billion fine last month, for its role in the catastrophic Deepwater Horizon disaster. BP also has close relationships with repressive regimes such as Azerbaijan, Russia and Indonesia (West Papua), and is being sued for complicity in human rights abuses in Colombia. BP or not BP? is part of the Art Not Oil coalition, and all the groups involved are part of the growing international campaign for fossil fuel divestment. There is a Facebook event for participants to register their interest. But what does “gross negligence” mean? It means, for the workers, unending trauma. Oil gushing for 87 days. Wings rendered useless and soiled. The babies hatch straight into crude. Toxic dispersants and no safety gear. Its plan is to let the world fry. Edinburgh Festival – it’s up to you!